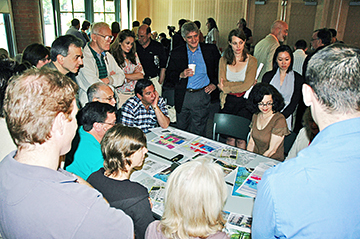 TRACK TO THE FUTURE: Development in town was the main source of dialogue at Saturdays Princeton Future meeting, which saw over 80 participants in the Community Room at the Princeton Public Library. Here, residents consider possibilities for the Olive May/West Coast Video site at a table discussion moderated by Michael Farewell. Borough Council unanimously voted to introduce its 2010 budget, which totals $24,716,958, at its meeting last week. The municipal tax rate will remain flat this year, with taxes continuing to fund 42 percent of the budget. The bedbug infestation at 205 Nassau Street continues to disrupt tenant lives and livelihoods, with resident Robert Carlson noting that the case is insanity at its finest, since no attempts to exterminate the insects have yet been made. With the primary election scheduled for June 8, three of the Boroughs Democratic candidates are vying for the two spaces on the ballot in November that correspond to two seats on Borough Council. The two who win the primary will be those who ultimately sit behind the dais beginning next year, since they will run unopposed by a Republican candidate in the fall elections. Leadership, one of Corner Houses three guiding principles (the other two are prevention and treatment), was front and center at the joint municipal agencys student leadership awards ceremony on Monday evening at Township Hall. He has won an amazing prize for himself and for the school, said Princeton High School (PHS) teacher Malachi Wood, describing sophomore Spencer Costanzas recent win in the Microsoft Bing Earth Day Photo Contest. Jim Fuhrman is the ace of the pitching staff for the Princeton Day School baseball team but he didnt look like a star in the first inning of the state Prep B championship game last Thursday evening. Get pumped! May is National Bike Month, and just about everyone, from kids to grandparents can be seen cycling. They are pedaling to school, to lunch, to stores, on the towpath, and even up and down mountains.